This is a full flow oil filter kit. It will filter 100% of your engine oil. Special valve cover bolts on with no modifications. Filter is mounted to the side of the new valve cover. Kit includes new valve cover plate, filter, gasket, fittings and instructions. Only works with the later style of oil return pipe that measures 15" between the mounting bolt hole centers. Spare screw on style oil filter, for our model A and model B oil filter kits. Tired of that oil blow-by making your engine compartment look a mess? This unit clamps to your oil filter tube & a piece of flexible conduit routes the vapors out of the engine compartment. Comes with clamp that holds the flex conduit to the steering column. Oil dip stick 1928-34, just like the original with cadmium plating. Dipstick wiper 1928-34. This little gadget is actually a duplicate of an accessory that was manufactured by APCO back in the model A days! Mounts under the head nut above the water inlet on the side of the block. 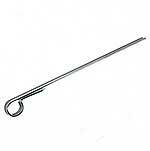 This has a piece of felt in it soo all you do is drag your dipstick through it to clean the oil from the dipstick. Stainless steel. Made in USA. 1928-31 Engine Oil Filler Tube. Presses into the block for filling the motor with oil. This is the later syle with the 3 separate oil baffles, but works on all years. A quality U.S. made filler tube, not a poor fitting import! Comes painted black. Oil breather 1928-34. Goes in place of the A-6763 oil filler tube. Cap is vented with a replacable mesh filter. Very similar in size to the original 1932-34 4 cyl. fill tube. Powder coated black with bare aluminium cap. Made in USA. Oil cap Steel 1928-31. Replace the missing or bent oil cap. 1928-31 Oil cap in black. 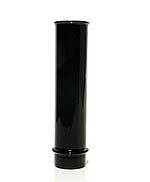 This cap is the baked gloss black finish which is resistant to gas and oil. Same cap as A-6766, but black finish. Replace the old rusted cap. 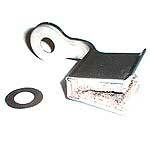 Ford supplied this part as plain, black enamel, zinc or terne finish. This is USA made from Ford prints. Excellent quality. 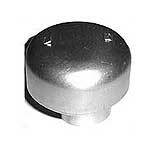 Oil cap Chrome 1928-32. 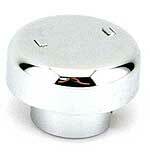 Chrome oil filler cap 28-32. Replace the missing or bent oil cap. B' filter kit with pressure relief valve 1932-34. This kit fits the 1932-34 4-cyl. Aluminum valve cover has built in filter system as well as adjustable pressure relief vavle that can be adjusted externally. Comes with full instructions for pressurizing the engine. Made in USA.